When we think of civilization, we think in Western terms: skyscrapers, factories, and automobiles. But as we progress, there is a growing need to live in tune with the natural world. While our affinity for the environments may seem relatively new, some civilizations have lived in such a way for centuries. 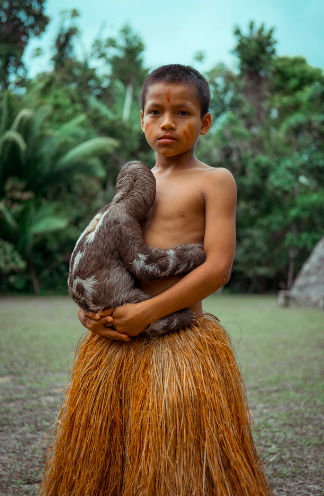 The forests of Peru are home to 15 “uncontacted” tribes, groups who live in voluntary isolation and reject all connections to the outside world. However, the reverse is not true. Industrialization and deforestation threaten to take large pieces of territory from these indigenous peoples. In December of 2017, the Congress of the Republic of Peru approved the construction of a road that would run along 172 miles of Peru’s eastern border with Brazil before connecting with the Interoceanic Highway, a 1600 mile stretch that links the two countries. The road was pitched as a way to jumpstart the economy in an area of Peru that was cut off from tourism and trade, but activists are worried. Clearing a way for the road would decimate 4 national parks and violate 5 protected areas belonging to the indigenous tribes. Activists also predict that the road will be a catalyst for more development, both legal and illegal. Drug traffickers are always looking for new opportunities to expand, and a road through the Amazon would provide just that. Some smaller encounters are equally devastating to relations between the outside world and the indigenous tribes of the Peruvian forest. In April 2018, Sebastian Woodroffe, a Canadian scientist who traveled to Peru to study hallucinogenic medicine, was killed in an apparent lynching after he was accused of killing 81-year-old Olivia Arévalo, a local shaman to the tribal village of Victoria Gracia. Authorities launched an investigation after videos surfaced on social media of Woodroffe being dragged along the jungle floor by assailants. They later exhumed Woodroffe’s body from an unmarked grave. The incident has proven to be disastrous to public perception of the tribes. When asked why they choose to remain isolated, members of these tribes often point to encounters their people had with colonists in the past and the violence and disease that resulted. Today, history seems to be repeating itself as modern society reaches further into an untouched and irreplaceable ecosystem.